This past week has all been about #mistakes and learning from them. As a business owner and an educator, it’s something I have had to learn fast, apply and then move on. The problem with learning from these mistakes is that we don’t always learn everything from that mistake and that same issue or problem might resurface itself so we can finish learning those lessons. When working with multiple platforms, the issue is remembering what #fix goes with what platform. This is when #YouTube, Facebook support groups for Small Business owners and of course looking up the Internet for your answers is a good place to start. I have known for quite some time that I have one of those annoying habits (not always to my clients though), that I am not satisfied or happy until I have fixed a problem regardless of the situation. This can create great learning outcomes in that curiosity and desire to learn more can create #innovative solutions that you might have not thought of before. One of the reasons to solve these problems or especially #tech issues is the frustration of finding help and support for #smallbusiness. 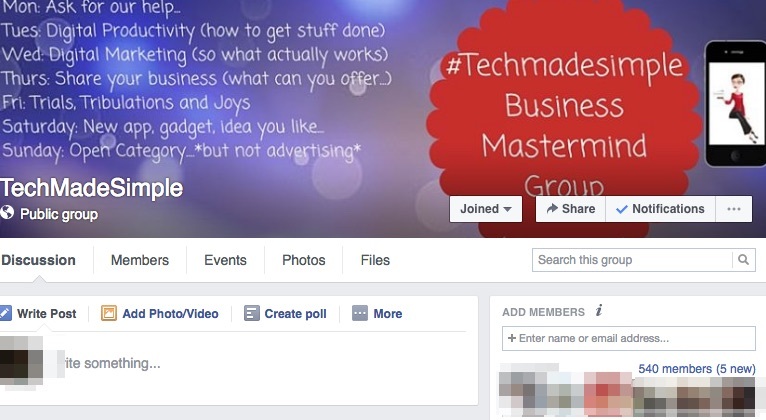 I set up a Facebook group called #TechmadeSimple last year and we are coming up to a one year anniversary of setting that group up. We have over 500 members in that group simply based on sharing our mistakes, finding people who can help and getting #tech support and understanding. I call it #techvent, when you share your frustrations and issues relating to everything #digital. I have set up one of the days as #AskforHelp – there is no question ‘too silly’ or #small as often timidly ask when they are talking about their tech issues. It’s one of my greatest joys to help solve these problems or at least point them in the right direction of people who can help. Lately, I have been working thru using #Windows10. I speak and understand several different platforms and own a device from each platform (you need to when being a #digitalcoach). The issue often comes up you need to be able to troubleshoot how to solve certain issues. Being someone who loves researching various topic, I have had to just #play with my new #surfacepro4 in order to work out basic functions and shortcuts. When getting a new device, here are some important tips you should find out. Remember, when in doubt – re-start your #SurfacePro or #SurfaceBook! Learn how to force quit, if your device crashes, this is a must have on any platform. On the surface pro, here are three options. Solution A (Force Restart): Step 1: Hold the ‘Power Button’ down, wait a few seconds and then press the ‘Power’ button again. Step 1: Pressing and holding the power button on your SurfacePro 4 or #SurfaceBook for 30 seconds and then release it. Step 2: Press and hold the volume-up button and the power button at the same time for at least 15 seconds and then release both. From here, the desktop screen may flash the Surface logo. Don’t be tempted to let go just yet and hold for another 15 seconds. Step 3: After you release both the power button and the volume-up button, wait 10 seconds and press and release the power button to turn your SurfacePro4 and SurfaceBook back on again. If your keyboard isn’t being recognised: Detach the keyboard and then use your finger to ‘tap’ the Start menu. Re-attach the keyboard and check to see if this works. If the pen isn’t working properly, go into ‘Settings’ and then ‘Bluetooth’ and ‘Remove Device’ and ‘Pair’ (re-connect the Stylus) to the Bluetooth settings. So, to wrap this up realise #learning #opportunities and then #moveon. Stay tuned for more #blog posts on using #Microsoft #SurfacePro4 and more to help #MicrosoftSMB.